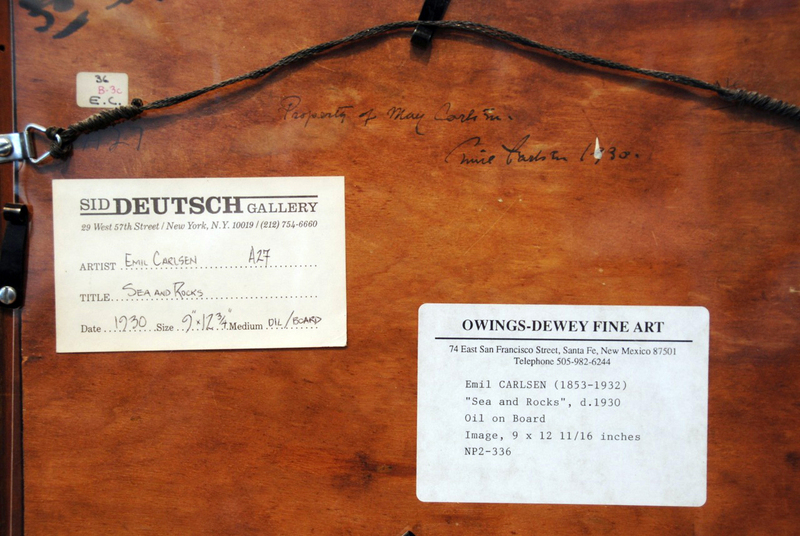 Label Location: Verso left center stuck to wood panel. Date 1930 / Size 9″ x 12-3/4″ / Medium OIL/BOARD’. Label Location: Verso right stuck to wood panel. Label Type: Thin felt tip pen writing. Label Location: Verso center top. Label Text: ‘Property of May Carlsen. / Emil Carlsen 1930.’. Label Type: Inventory small white label. Label Location: Verso top left. Label Text: ’36 / B-3c / E. C.’. – This alla prima study is of Bald Head Cliff, Ogunquit, ME. It is a study for the final painting White water, 1930.